You remember, back at the beginning of the year, I made the commitment that I would that every book series that I began in 2014. And I mean to keep that, I do. Really. 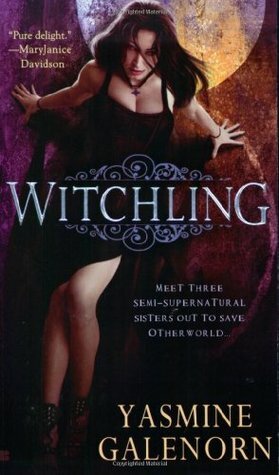 Then my podcast co-host suggested that we read Witchling by Yasmine Galenorn for the show. I readily agreed, since I know that she has good taste. I checked it out on GoodReads and saw that it was the first book in a series. And then I saw that this series currently has fifteen books in it. That’s . . . a lot. Luckily, the first book drew me in and made me excited. Otherwise, I’d be in trouble. In Witchling, we meet the D’Artigo sisters: Camille, Delilah and Menolly. The three are half-fairy, half-human, now living Earthside. This first book is told from Camille’s point of view. She is a witch, but due to her half-breeding, her spells don’t always go right. Her sisters have similar issues. Delilah ended up being a were, but instead of a fearsome beast, she turns into a tabby cat. She also doesn’t have the best control over her transformations. Menolly has a whole other issue – she has been turned into a vampire. At the start of the book, supernatural creatures are now out of the “broom closet,” so to speak. Most full blooded humans (also called FBH) are fascinated by the fae, but there are of course some who are less than pleased. The D’Artigo sisters work for the Otherworld Intelligence Agency, charged with keeping relations between humans and supernaturals smooth. Unfortunately, someone out there is murdering supernaturals. Jocko, a “small” giant, is found dead, the rope used to strangle him seething with demon energy. Camille and her sisters are pulled into the mystery of trying to find out where these demons came from and what they are doing Earthside. Demons are not the only thing to worry about. There’s also trouble brewing at home, which threatens to throw Otherworld into a devastating civil war and cutting off the Earthside fae from their homes. In addition to all that, Camille has personal problems of her own, namely men. There’s Chase, a FBH operative for the OIA who is doing everything he can to win Camille’s affections (it’s not working). There’s Trillian, a dark Svartan and the bad boy that Camille can not resist. There’s Morio, a Japanese kitsune sent to help them. And then, the most complicated of them all – Smoky. He’s not exactly human or fae. He’s a dragon, who can when necessary take human form (and no, Smoky is not his real name, but he won’t give them that). If you’re looking for serious literature, this is not for you, but this book was a good time. The mythology and paranormal stuff was interesting, the characters are fun, and the story has a lot of twists and turns that keep you guessing. I really like these three sisters. They have a strong bond with one another and you can’t help but root for them, even though they are somewhat inept at what they do. And yes, even though this series has a ton of books, I plan to finish it. I’ve already finished book two, Changeling, and I am half way through book three, Darkling. Reviews of those will come along soon.